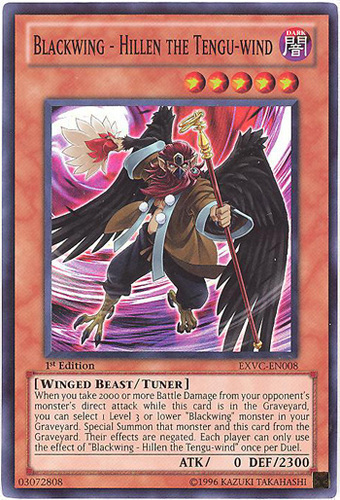 When you take 2000 or more Battle Damage from your opponent's monster's direct attack while this card is in the Graveyard, you can select 1 Level 3 or lower "Blackwing" monster in your Graveyard. Special Summon that monster and this card from the Graveyard. Their effects are negated. Each player can only use the effect of "Blackwing - Hillen the Tengu-wind" once per Duel.